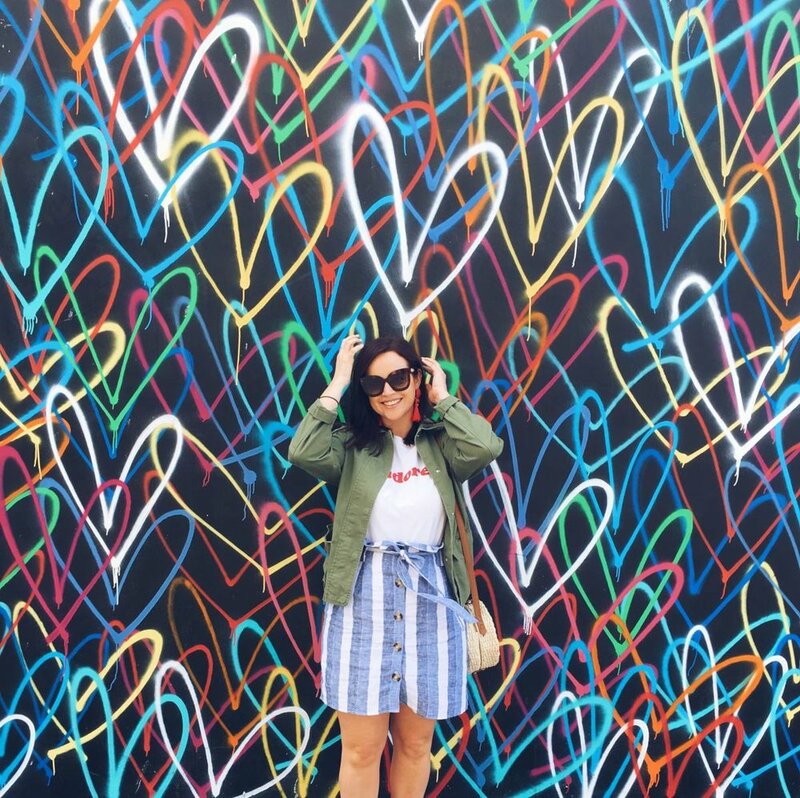 I mentioned in this post on Sunday that I wanted to write some little travel diary style posts while we are away on this trip, and today I'm back with my second one, all about falling in love with LA. I'll be honest - I didn't expect to love LA. You guys all know that I'm a die hard New York obsessive, and from what I'd heard and read, LA was so different that most people didn't exactly fall head over heels for the sprawling, palm tree lined city. But from the moment I got my first glimpse of the Hollywood hills as our plane spiralled for landing, I was caught. It probably helps that our arrival in LA was perfectly timed with golden hour. Or the fact that when we picked up our car (a proper American SUV!) at around 7pm, Hotel California by The Eagles was blasting on the radio when we started the engine. Or perhaps it was because our journey to the hotel felt like something out of a film, filled with more palm trees than I've ever seen, and so many shots of the Hollywood sign all lit up in golden light. Whatever it was, my unconditional love for this weird and wonderful city was confirmed when we arrived at The Line hotel, opened the door to our room and were greeted with this view. We basically sat on the end of our bed, open mouthed, for about half an hour before we so much as bothered to unpack or check out the bathroom - it's safe to say that we were well and truly mesmerised. It's true that LA is so different to New York, but I kinda liked how different the experience is here. It's hard to comprehend just how sprawling this city is - it can take you 45 minutes to get from one spot to the next (especially in the rush hour traffic which we experienced yesterday! ), but it feels so cool to drive down Hollywood Boulevard or Rodeo Drive, noticing all those iconic movie hotspots on your journey. We tried to squeeze as much as we could into our 3 days there, but in truth, we only managed to scratch the surface. We hiked in the Hollywood Hills, rode rollercoasters at Universal Studios and spotted stars on the Walk of Fame. We hunted out the Instagram hotspots, hung out at one of the world's biggest record stores and ate delicious room service in bed. We drank beer in local breweries, strolled along the impossibly white sand in Santa Monica and shopped on Abbott Kinney. It feels like our days here have been so full, but we already feel desperate to come back to see everything we've missed. I think my favourite thing about LA has been the whole vibe this city seems to have. Everybody here is beyond friendly (so much so that us stiff upper lip Brits were a little bit unnerved at first! ), and unlike in New York, it doesn't feel like everyone is in a rush. That might have been because we were here over Memorial Day weekend (a bank holiday here in the States), but it definitely felt like life was being lived at a more meaningful pace, which we found so inspiring. It's safe to say that 3 days in this beautiful city wasn't enough, and I really hope that we get the opportunity to visit again in the future. Today we'll be checking out of our beautiful pastel pink motel in Santa Monica and starting our drive up the coast, which I'm so excited about. Our first stop will be Santa Barbara where we'll be staying this evening, and then we'll continue up to Morro Bay, through Big Sur and on to Monterey. I feel so lucky to be doing this trip that I regularly keep having to pinch myself! But first, Sam has promised me a delicious breakfast in Malibu, so I suppose I'd better go and wake him up!